The offense may not be as high powered as years past, but for the Chargers, it’s all about wins. Sunday at home the team was again somewhat blah on offense, using the run and the pass in a 26-16 win over the now 0-4 Dolphins. Bolts QB Philip Rivers was 21 of 31 for 307 yards and one touchdown, and RB Mike Tolbert ran for another score. The defense did a good job holding the Dolphins in check, and they also knocked Dolphin quarterback Chad Henne out as well. Henne hurt his left shoulder at the end of a run on a broken play on the Dolphins’ second possession and didn’t return. 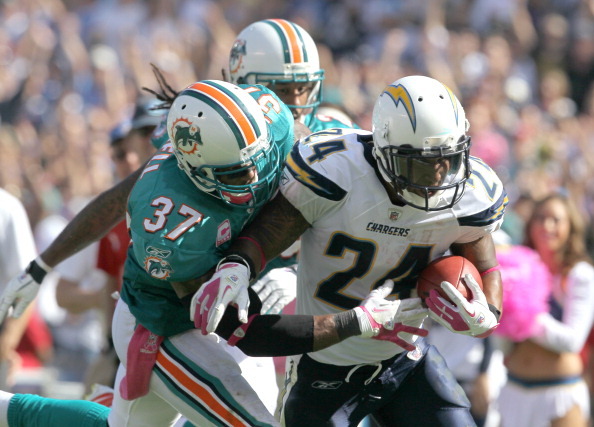 Although backup Matt Moore led the Dolphins to the game’s first TD, Rivers’ passing eventually overpowered the Dolphins. Rivers threw a 55-yard touchdown pass to Vincent Jackson to tie the game at 7 late in the first quarter. Ryan Mathews’ 42-yard gain on a screen pass set up Tolbert’s 1-yard leap over the pile for a 20-10 lead for the Chargers (3-1) early in the third quarter. The Chargers managed to score two touchdowns. They got four field goals from Nick Novak, from 27, 48, 23 and 38 yards. Rivers took a knee three times inside the Dolphins’ 20-yard line to end the game. Jackson, who was in and out of the game, apparently due to an abdominal injury, had three catches for 108 yards. Mathews had another solid day, running 16 times for 81 yards and catching five passes for 68 yards. Henne and Moore were each intercepted once. Chargers star tight end Antonio Gates missed his second straight game with a sore right foot, an injury that’s bothered him since last season. 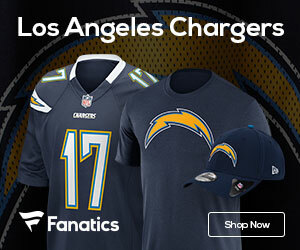 It was the second week in a row the Chargers beat a winless team at home without a lot of flash. The previous Sunday, the Chargers beat the AFC West rival Kansas City Chiefs 20-17. The Chiefs got their first win Sunday by beating the winless Minnesota Vikings 22-17. Henne was hurt at the end of a 1-yard run in the first quarter. He went to hand off to Lex Hilliard, who wasn’t ready for the ball. Henne was hit by Shaun Phillips and stayed on the ground for a few minutes. He walked off the field, then went into the locker room. When he came back out to the sideline, it was clear he wasn’t going back in. Moore came in and completed a 31-yard pass to Charles Clay. Hilliard capped the drive with a 4-yard TD run, but it was overturned after replay, with the officials saying his knee was down inside the 1-yard line. Hilliard then dove over the pile to give the Dolphins a 7-0 lead. Rivers needed three plays to tie it. After consecutive first downs, he lobbed the 55-yarder to Jackson, who dived to make the catch, then got up before a Dolphins defender could touch him, and scooted into the end zone. Reggie Bush, playing as a pro in his hometown for the first time, ran 13 times for 50 yards and caught two passes for 15 yards. Miami’s best weapon was Dan Carpenter, as he hit field goals of 41, 37 and 51 yards.